A list is a curated group of Twitter accounts. You can create your own lists or subscribe to lists created by others. Viewing a list's timeline will display all the most recent Tweets from everyone on that list only. To add or remove people from your list. Click the 'gear icon' on an account’s profile to display the drop down menu. A pop-up will appear displaying your existing lists. Click the checkbox next to the lists you would like to add the account to, or uncheck the lists you'd like to remove the account from. To create a new list, click on the 'Create a list' button. Click on the 'Lists tab'. Click on the list you'd like to view. As well as creating your own lists, can also subscribe to lists created by others. Click on 'Lists' when viewing someone's profile. From the list page, click 'Subscribe' to follow the list. You can follow lists without following the individual accounts in that list. Click on the Twitter list that you’ve been added to. Click on the profile of the person who created the list. Making the most of lists – How to use lists like a pro! 3rd party tools such as TweetDeck and HootSuite allow you curate your lists and view them all in one place. One of my favourite tools is TweetDeck. With TweetDeck you can create columns for all your lists allowing to view the feeds from all your lists all in one place. 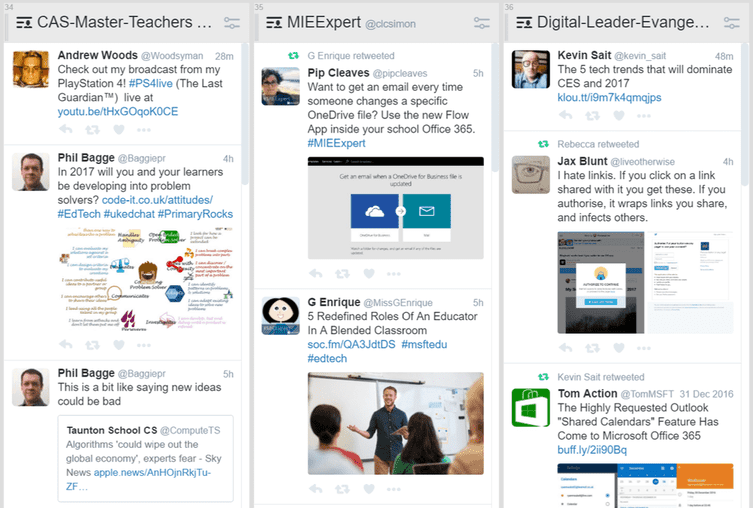 Use FREE 3rd party tools such as TweetDeck to help manage your lists. Tags: Twitter, Social Media, Lists, TweetDeck, Hootsuite, buffer, top social media platforms, top social media sites, top 10 social media websites, top social networking platforms, main social media platforms, different social media platforms, most used social media platforms, Twitter.